UKDN Waterflow, the UK’s largest independent drainage provider, has taken delivery of a next generation 26-tonne Huwer Combination Unit-26T with Easy Recycling jet vac unit that will set the new drainage standard within the UK. The vehicle, supplied by specialist jet vac supplier Huwer, was recently shipped over from France and is one of a new generation of lightweight recycling vehicles, with UKDN Waterflow receiving the first. The jet vac system, which is significantly lighter and less complicated than previous systems, is as powerful as previous 32 tonne versions, but its advanced recycling systems mean that it can stay on site longer, and increase productivity. The High Pressure jetting is provided by a Uraca P3-45 HP Pump delivering 77 Gallons a minute @ 3,000psi and the Suction is provided using a Vacuum Vane Pump HU2000. 1200cfm @ 60% Vacuum 98hp. 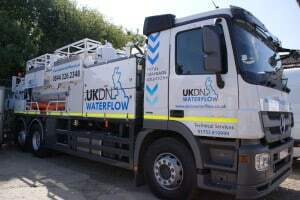 The vehicle provides a greater ability to get into tight spaces through the use of rear wheel steering, great for use in confined areas and city centres, and is fully Fleet Operator Recognition Scheme (FORS) and Crossrail compliant, supporting UKDN Waterflow’s commitment to safety. And the introduction of a fall arrest gantry system for engineers further improves the safety whilst working at high level on these vehicles. A high tech control system on the rear of the vehicle gives engineers a superb understanding of the jet vac system, tracking and monitoring tank levels and systems, and quickly diagnosing any issues. This means fault diagnosis is greatly improved, meaning less downtime and greater reliability of the vehicle. Like a car the diagnosis system even alerts the engineer when it requires a service. And driver comfort too has been considered; with the cab fully air conditioned and Bluetooth enabled, and a heated screen to ensure a clear view of the road in any conditions.